Defi DIN Gauge UNIVERSAL - Pann Auto Performance - San Diego largest aftermarket automotive performance parts - What do you drive? 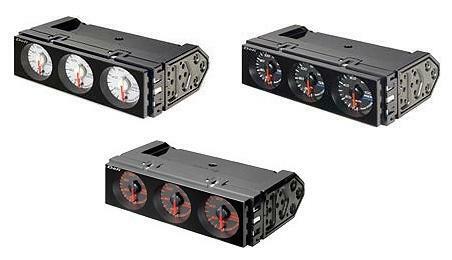 The Defi DIN-Gauge is a 1-DIN sized triple meter for providing information on a pressure and 2 kinds of temperatures. “DIN” is an abbreviation for Deutsche Industrie Normen(German industrial standard) and the most of audio hardwares are designed in the DIN size. 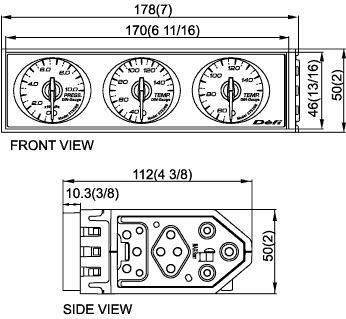 DIN-Gauge can be neatly installed in a DIN sized vacant space in your automobile. Three guages are fitted into one DIN size. The front cover of the gauge has flat face glass. Opening and closing mode: The needle pointers of three gauges move sequentially. Maximum angle 270degrees is controlled by the microcomputer up to 4,600 divisions(0.057degrees) to provide high precision in the accuracy of information generated. Quick response which is sustainable in racing scenes. Bright transparent green gauge dials and red instrument needle pointers are used in the gauges to increase visibility at night. The lights are produced from super high bright LED lamps. DIN-Gauges for right-hand drives and left-hand drives are available. This product is for use ONLY on vehicles with a 12V electrical system.